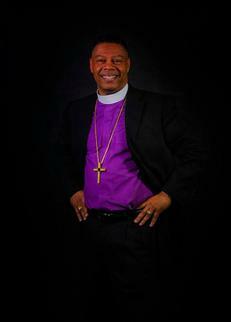 Bishop Joseph V Mckoy Jr,D.MIN, M.A., B.S., A.A.
​BISHOP MCKOY WAS BORN ON SEPTEMBER 13, 1956 IN BALTIMORE, MARYLAND. HE IS THE THIRD CHILD OUT OF SIX SIBLINGS. IN 1997 AFTER HEARING THE VOICE OF GOD, HE WAS CALLED BY GOD IN THE MINISTRY AND WAS LICENSED AS A MINISTER IN 1998. IN 2000 HE WAS ORDAINED AS AN ELDER AT THE INTERNATIONAL BIBLEWAY HOLY CONVOCATION. IN 2004, BISHOP MCKOY WAS ELEVATED TO DISTRICT ELDER AND ALSO LATER THAT SAME YEAR, ASSIGNED AS ASSISTANT PASTOR. ON DECEMBER 31, 2008, THE LORD CALLED BISHOP MCKOY FOR A WORK IN THE MINISTRY AND ON JANUARY 11, 2009 BISHOP MCKOY BECAME THE PASTOR AND FOUNDER OF TEMPLE OF PRAISE AND DELIVERANCE CHURCH OF CHRIS, INC, AS HE STEPPED OUT ON FAITH WITH HIS WIFE AND SEVEN OTHER FAMILY MEMBERS. BISHOP MCKOY STARTED A WORK FOR THE LORD IN A SMALL BANQUET ROOM IN THE AMERICA’S BEST INN HOTEL ON FRANKFORD AVE AND SOON IT WAS FILLED TO CAPACITY. IN DECEMBER 2009, THE LORD BLESSED TEMPLE OF PRAISE TO RELOCATE. THEY HELD THEIR FIRST WORSHIP SERVICE AT 2917 WEST BELVERDERE AVE ON 24 JANUARY 2010. BISHOP MCKOY BEGIN TO TEACH AND PREACH THE WORD OF GOD WITH THE ZEAL OF THE LORD. BY THE END OF THE YEAR THE LORD BLESSED TEMPLE OF PRAISE AND THEY WERE ABLE TO PURCHASE A BUILDING, THUS GIVING THEM A PERMANENT PLACE TO WORSHIP AND FELLOWSHIP. BISHOP MCKOY HAS WORKED FOR BALTIMORE COUNTY PUBLIC SCHOOLS SYSTEM AS A SUPERVISOR/FACILITATOR SINCE DECEMBER 2000. BISHOP MCKOY’S EDUCATION INCLUDES A DOCTOR’S DEGREE IN MINISTRY, A MASTER OF ARTS DEGREE IN EDUCATION/TEACHING, A BACHELOR’S DEGREE IN BUSINESS, AND AN ASSOCIATE’S DEGREE IN THEOLOGY. BISHOP MCKOY IS MARRIED TO THE BEAUTIFUL AND LOVELY WIFE OF HIS YOUTH, FIRST LADY WANDA MCKOY AND THEY HAVE TWO DAUGHTERS, FOUR GRANDCHILDREN AND ONE SON IN LAW.